"Diorio truly delivers a custom product. Ron, Sandy, Jenny, Diane, Eric, Tim and of course the subs, delivered marvelously. Thanks for making the process go smoothly." "Choosing R.L. 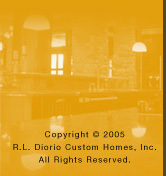 Diorio custom homes to build our home was the best choice we could have ever made. Not only was the construction first class, but Ron, Jenny, Diane and the rest of the crew were totally professional and extremely helpful in making the always tough decisions with home construction. We are completely satisfied with the total experience & would recommend them to others interested in a quality custom home."